Does not man see that it is God Who created him from sperm? Yet behold ! he is an open disputer !! 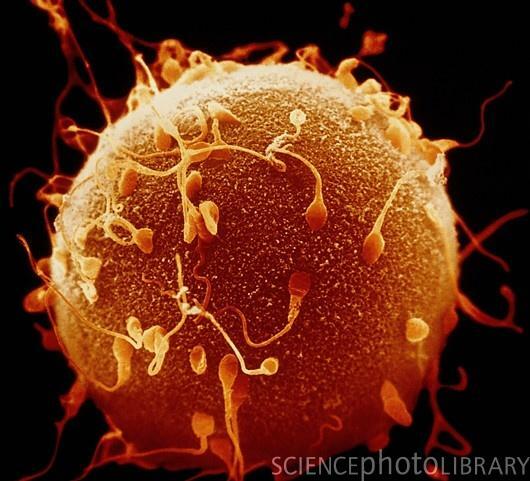 Coloured scanning electron micro- graph (SEM) of sperm on the surface of a human egg (ovum) during fertilisation. Sperm appear as hair- like structures; each sperm has a head, neck, and a long tail. 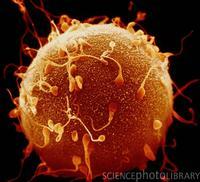 Here the sperm are attempting to penetrate the thick surface of the egg that attracts them and enables them to attach. The human female usually produces a single large egg, and only one of the millions of male sperm released may penetrate the egg to fuse with the egg nucleus. Once fertilised, the egg begins its process of growth into a human embryo. Magnification: x880.